Ryan getting the day started at 41"
First time with the “Silverback Strong”. Had great partner, Jessica. Casey P. gets an “atta girl” for missing the box, stepping back, resetting her mind and getting back in it. I know how that feels. My psych this morning was attempting and landing the 24″ box! 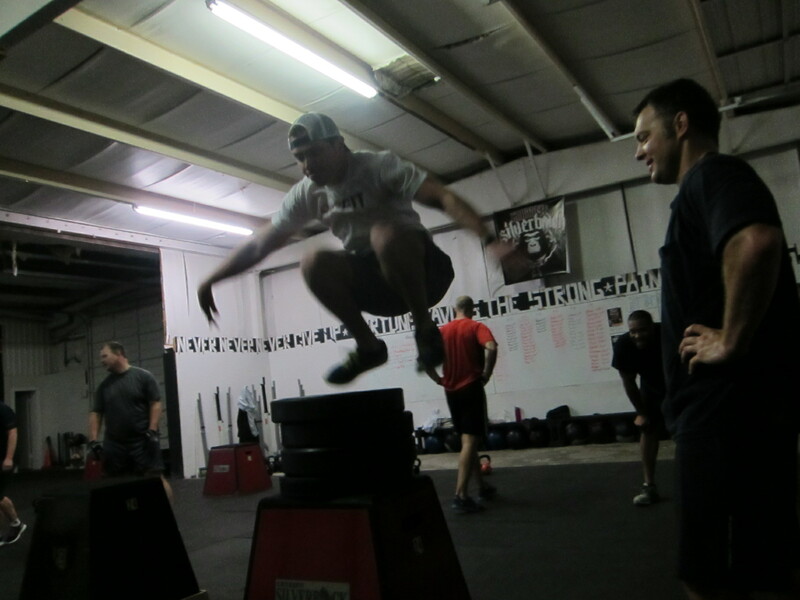 This is my first time EVER to jump the 24″ and I nailed it! Guess what I get to say…..
Way to go Linda! I’m impressed. I might just have to attempt the 16″ one again! You the Mama Linda. way to go. OK Linda – you inspired me and gave me courage! I conquered the 16″ box today! Look at Ryan going all “Ninja”!!!! Lets just say Ryan was in rare form this morning. Beware of the pre-workout drinks that make you feel like you just smoked crack. Couple of the ladies in the 630p class really “woman’ed” up to their anxiety and nailed some huge personal bests for box jumps as well. Big Hats off to them. This still doesn’t explain what exactly “silver back” strong is..